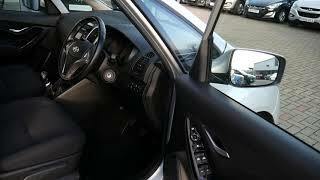 Hi and welcome to JT Hughes Hyundai here in Shrewsbury. My name's Rob. Just going to take you around this used Hyundai ix20, 65-plate, done just under 21,500 miles. This is the petrol SE model, as you can see in silver, so it looks absolutely stunning. Comes very well equipped, body coloured mirrors with indicators in them, alloy wheels. You've got your rear parking sensors. The ix20 rides a little bit higher of the ground, so it's an easy car to get in and out of, flat loading area, 60/40 split rear seats for any larger items, parcel shelf there to keep all your shopping and your luggage nicely out of sight. Under the boot floor there, you've got additional storage, or you can drop the boot floor down for additional height. And then, underneath that tray there you've got your space saver spare wheel. If we move into the rear passenger compartment, as you can see, loads of leg and headroom. The rear seats, you can actually recline them, or you can have them more upright as they are at the moment. Three full seatbelts across the back, ISOFIX fitting on the two outer seats. You've got a centre armrest there, pocket on the back of the front seats for additional storage. And we have electric windows in the rear. So this car's only done just under 21,500 miles, so really low miles, been very well-looked after. And if we move into the front, again front seats are nicely shaped and supportive, height-adjustable on the driver's seat, centre console there with plenty of storage. You've also got an armrest with the driver's seat, obviously fold that away if you don't wish to use it. Power socket there by the handbrake, 5-speed manual gearbox, USB, auxiliary input, power socket, air conditioning. You've got your CD radio. On your steering wheel, you've got your audio controls, you've got your Bluetooth for your phone, and your trip computer buttons, so everything's really nicely at hand. Auto lights. You've also got Stop/Start technology on this car to make the most of your fuel, as well as Traction stability control. And in the driver's armrest, you've got controls for all the electric windows and the electrically adjustable and retractable mirrors. So there we have it, a really nice example of a Hyundai ix20. If you'd like any further information, please contact JT Hughes Hyundai Shrewsbury on 01743 450888.